Today more wastewater treatment plants are facing tougher state and federal requirements including those issued by the National Pollution Discharge Elimination System (NPDES). Since inception, the implementation of NPDES regulations has been delegated to the individual state level. Permits for the control of discharges are issued based on the technology available to control pollutants and limits that protect the water quality of the particular state’s receiving water. This includes regulations by the National Pollution Discharge Elimination System (NPDES) for the dissolved oxygen (DO) content of wastewater treatment plant outfall which enters U.S. waters. To help meet these requirements more wastewater plants are using aeration equipment at the plant outfall. This can be either mechanical aeration or cascade aeration. Early efforts by the Environmental Protection Agency to control pollution concentrated on the prevention of waste discharge and reduction of floating debris. In the early 1900’s frequent low dissolved oxygen excursions resulted in noticeable numbers of fish kills. Today, water issues are a main public concern. 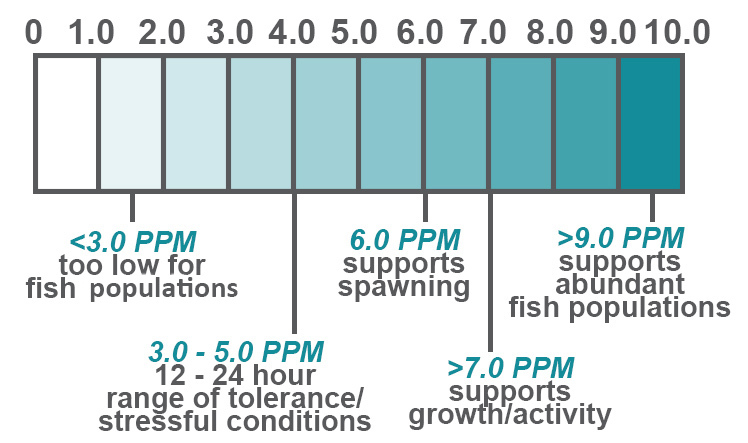 Testing has shown that the minimum DO requirement for aquatic life at any life stage is 2 mg/l, and survival of the entire population requires a minimum of 5 mg/l. These numbers will vary depending on the makeup of the population. These studies and the desire to protect natural aquatic life have resulted in permitted requirements for DO in wastewater plant outfall which, depending on the state, generally range 6 or 7 mg/l. 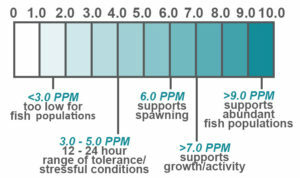 Changes in the permitted levels typically would occur at permit renewal time. The recent trend for this requirement is increasing rather than decreasing. Many plants, particularly in northern climates where saturation levels are higher, can achieve the desired level of DO without additional processing. In warmer areas, and those with high DO requirements, DO in plant outfall may be supplemented with additional processing by various methods. Each individual plant will assess their resources and needs to determine which type of DO infusion will be the best for their plant. Considerations such as elevation, operational costs, available land footprint, and life expectancy are typical.